What would you say are some of your habits? Maybe you bite your nails? Or you work out daily? Or you always eat breakfast before brushing your teeth? A habit is a practice that becomes routine, and it's typically hard to give up or change. So when you bite your nails, most of the time it's down past the skin. Or when you don't workout regularly, but try to start... it takes extra work to keep at it until it becomes a part of you new routine. It is said that it takes about 7 weeks to form a habit, so if you were wanting to start something or change something that isn't in your routine, you would have to keep at it for at least 7 weeks before it becomes a habit. Have you ever thought about the habits that you have when you come home from work for the day? We all have habits when we get home. Habits like taking our shoes off at the door or hanging our coats up in the entry-way closet. What about dropping your purse or briefcase off on your kitchen counter and laying your keys beside it? Crossing off the day on your hanging calendar or writing "milk" on the grocery list because you just drank the last bit. Have you ever thought about how these habits could be affecting your security? Well, lets think about it, shall we? These habits can affect your security and safety greatly. 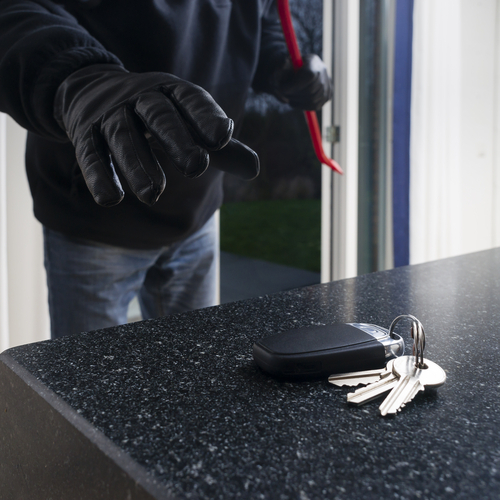 Once a burglar is in your house, he'll be looking to find out what your daily routine will be. He will notice how your purse is always going to be easily accessible on the kitchen counter - along with your car keys. Your calendar will be very useful to him. The thief will look for key dates - when you will be on vacation, when you have a doctor appointment, when the next soccer game will be, and that ever growing grocery list on the refrigerator will need to be fulfilled at some point. He will be looking for any clues as to when you will be out of the house during a time that's convenient for him to make his move on your precious valuables. Now, what can you do to make it harder for this person who is trying to learn your life? Be proactive. Start creating new habits for yourself at home. Store your purse and keys in a secure location in your home, somewhere that isn't easily accessible for someone that's looking to just take it off the kitchen counter. Also, look into keeping a handheld calendar instead of a hanging one. Or if you need the entire family to be aware of the calendar, use a password-protected shared one on the internet where your spouse or family has access to see what's coming up. Also, be careful as to what you share on social media. Going out of town is very exciting, and it can be so tempting to take a picture on the plane and say "vacation bound" in your photo caption. But that's an open invitation for someone to come and rob your house while you're gone. Consider waiting to post vacation pictures until you're already back home. It seems so silly, because your home should be your safe place. A place to let your guard down and to hang your calendar and to throw your keys on your counter. But unfortunately, burglars know this all too well. So we have to start changing our daily routine to make our risks of being robbed significantly lower. Having a security alarm system in your home helps and is highly recommended... but eliminating all sources of temptation for the bad guys trying to memorize your daily routine will be a huge advantage to your safety too. We, here at Saturn, take your safety to heart. In addition to protecting your homes with our top-of-the-line security systems with amazing low monthly costs, we want you to be proactive and try to help your old habits become new measures of keeping your family safe.